Update: Econet has since suspended selling Kwese TV after the government announced that Kwese is operating illegally. After weeks of speculation, Econet has finally announced the availability of the Kwese pay TV service at its shops in Zimbabwe. In an announcement on social media the newspapers today, Econet said customers can now visit any of its shops around the country and pay $49 to get a decoder, free installation and the first month. In terms of ongoing subscription prices, you probably know that Kwese, unlike Multichoice, essentially has a single bouquet. Your choice comes on subscribing either for a month, 7 days or just 3 days. The monthly subscription, from what we gather, is $29. The 7-day subscription is $9 and the 3-day $5 (This is not confirmed however and we’ll confirm once we get the official word). 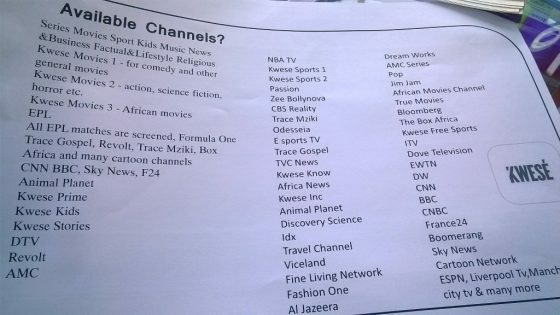 If you’re wondering what channels and content you’ll get on Kwese, you can check out the KweseTV.com official website. Most of the Techzim readers have been interested in the big question of EPL soccer channels. A Twitter user who says they visited an Econet shop today posted a picture of list of channels Kwese Zimbabwe has on offer and that list says “All EPL matches are screened”. This is particularly interesting because all along it was generally believed that Kwese TV only has access to 1 EPL match per week, which would be screened over the weekend. If all EPL matches are available on Kwese TV for just $29 a month, Kwese may indeed be an immediate huge disruption to Multichoice. Kwese has essentially become the only serious competition to Multichoice’s DStv ever in Zimbabwe. Elsewhere in Africa Multichoice have competition from StarSat, Zuku TV and Kwese. In Zimbabwe, it’s really just Kwese TV and maybe pirate tv services on South Africa’s Openview HD. You want Kwese? Please fill in this simple form and we will do our best to hook you up. Haaa watanga breaking down what these are retrogresive people in our society please if you feel you have enough money remain with DSTV period breaking down what ?? http://www.kwesetv.com – connection times out each time. Not a very good start compared to the fast responding http://www.dstv.com. “All EPL matches are screened”. Nhai OP? CAN YOU FIND OUT ABOUT THIS? We ALL know SuperSport has got the rights to screen EPL matches in Sub-Saharan Africa and this were made available to a single bidder and Kwesé only got the “one match per GW and highlights” package. OR was that last season? Or maybe SS only got the rights for SOUTH AFRICA? Like when they got the rights for Australian Cricket matches where they would only broadcast in SA and Kwesé, the rest of Africa? Will that also mean there will be no EPL for the rest of Africa from SuperSport? WE NEED THIS INFO mhani. Unless you can cover the same sports channels/events that DSTV covers, including Australian cricket, then sadly we will not be changing over. Also agree with Noni that we need the British TV programmes. This is an excellent development! Though I no longer watch scheduled TV, this is very much welcomed. cant wait yooo.hope they wil make it easy to subscribe unlike multichoice wher u hav to suffer for u to pay the damn subscription. No British tv shows so, unfortunately, it’s a no from me. All I watch on DSTV are the Brit series. And can I pause, rewind and record paKwese iyoyo? If not, still a resounding no from me. Yaa well lets not count our chickens beforebthey hatch but anwz gudluck to econet. Is it possible to only purchase the set top box only since we already have the infrastructure? If yes, how much does one pay for the decoder only? Does KWESE TV have an option for extra view? Think kids section is limited if you add Disney ts a yes for me multi Choice to hell with it.